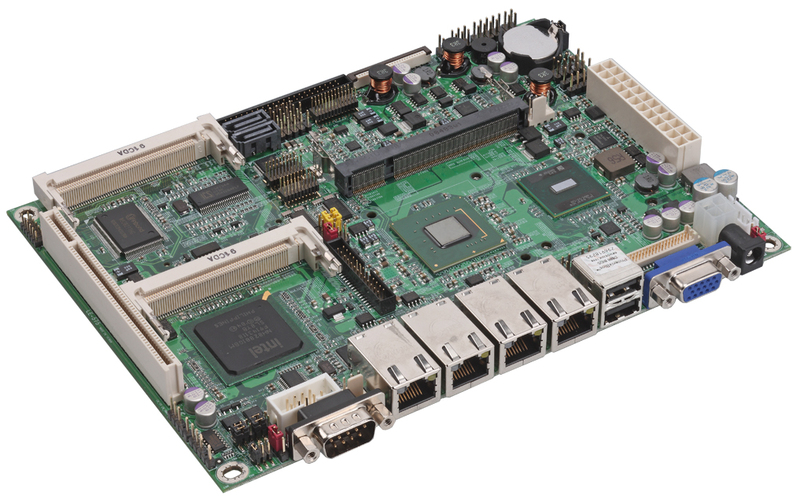 The 5.25" embedded mini-board LE-575 based on the Intel® 945GSE Express Chipset, supports Intel Atom processor N270, implemented in 45nm technology, is power-optimized and delivers robust performance-per-watt for cost-effective embedded solutions. The board offers an excellent solution for embedded market such as digital signage, kiosks, POS, thin clients, digital security, and commercial and industrial control. It also comes with four Intel Gigabit LAN ports, specifically designed for mainstream IDS/IPS, Anti-virus, VPN gateway and UTM applications. CPU: Intel® Atom N270 processor 1.6GHz @ FSB 533MHz. Memory: 1 x DDR2 SO-DIMM up to 2.0GB. Chipset: Intel® 945GSE & ICH7M Chipset. VGA Interface: Intel® integrated GMA 950 Technology. LVDS/DVI: Onboard 18-bit dual channel LVDS I/F. Optional secondary LVDS (18/24-bit dual channel) or DVI I/F. Serial ATA: 2 x SATA up to 150MB/s transfer rate. Solid State Disk: IDE supports 44-pin DOM with +5V, one CF Type II socket. LAN Interface: 4 x Intel 82574L Giga LAN. Audio: Integrated ICH7-M with Realtek ALC888 HD Audio. 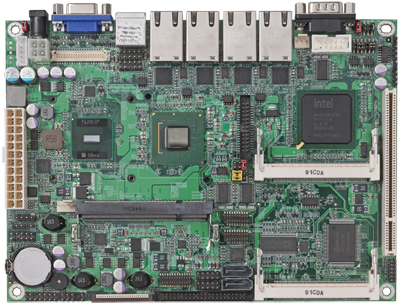 Extended interface: Two Mini-PCI bus add-in card socket and one PCI slot. I/O Ports: 5 x RS232 and 1 x RS232/422/485 Serial Ports, 8 x USB2.0 ports, 1 x PS/2, 1 x SPDIF, 1 x Parallel port, 1 x FDD. 2 x Serial ATA II Interface with 150 MB/s transfer rate.